We are engaged in manufacturing and supplying best grade Roofing and Cladding. With an aim to ensure the peerless standards of offered roofing and cladding, we manufacture these using best grade raw material, sourced from the authentic vendors. Further, to get relieved on the designing front, we make use of modern machinery and latest technology in manufacturing process of these roofing and cladding with the assistance of experienced professionals. 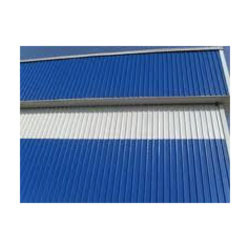 To fit the requirements of patrons, we are engaged in offering Roofing and Cladding in varied profiles and colors. Offered roofing and cladding are used for interior & cover roof and wall panels & liners and partition panels.